A bridge over the croc-infested Bakong River: The crocodiles are often seen sunbathing on the banks at the nearby Kampung Beluru. MIRI: Sarawak Forestry Department should consider culling crocodiles in Bakong River in Miri Division in view of the increasing number of attacks by the reptiles on people and to prevent the situation from getting out of control. Assistant Minister of Local Government Datu Dr Penguang Manggil, who is Marudi assemblyman, made this suggestion when commenting on the latest crocodile attack on a resident of Rumah Benang in Marudi constituency on Sunday. “I urge the Forest Department to look into the possibility of culling the crocs before it goes out of control as croc attacks went up as far as Sungai Peking as well as upper Bakong which was never heard of previously,” he said. 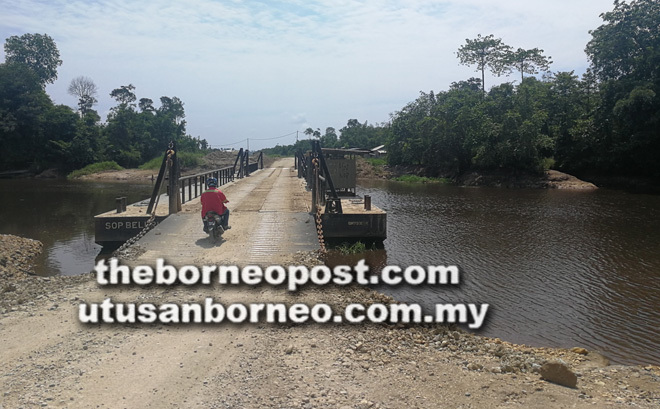 Penguang, who comes from an Iban longhouse in Sungai Entulang, said the crocodiles along Bakong River and its tributaries are getting more daring and attack pigs and poultry which are caged behind longhouses by the river side. The reptiles are also often seen sunbathing at Kampung Beluru near Beluru bazaar and along river banks, he added. As Bakong River has become seriously crocodile–infested, he advised the riverine community and those wishing to fish there to exercise extra care and go in groups of two persons or more. Penguang said the latest victim, Mangku Sulo, 56, from Rumah Penghulu Benang was fishing in the river with five others from the same longhouse on Sunday when he was attacked but was lucky to have survived and is now recuperating in Miri Hospital. Mangku said he was casting his fishing net at 2pm when a crocodile sneaked up and attacked him. It happened so fast that he did not know what happened but felt something bit his right foot and dragged him into the water far from the river bank. However, the crocodile let go of his foot and Mangku made a desperate swim to the river bank. When he reached the bank, he turned to look back and saw the crocodile with only its head visible, thankful that he survived the attack with only a 12cm-long cut on his right foot. As provided by the Wild Life Protection Ordinance 1998 (WLPO) Sarawak Forestry Corporation (SFC) has undertaken culling of crocodiles deemed to pose danger to the public or when attack on humans occurs. Last year, it issued five licences to cull crocodiles following fatal attacks in Santubung, Pusa, Baram, Sebuyau, Selalang and Paloh. In 2016, Forest Department director Sapuan Ahmad said crocodiles are found plentiful in 10 rivers in Sarawak and surveys conducted from 2012 to 2014 showed that these rivers had eight to 14 crocodiles for every kilometre, with Batang Lupar having the most. He said the 10 rivers were among 45 rivers with a total length of 2,108.38 km where an estimated 12,000 crocodiles live. The rivers are Batang Sadong, Sungai Tuang, Batang Kerian, Sungai Seblak, Sungai Linga, Sungai Sebuyau, Batang Lupar, Batang Saribas, Batang Baram and Sungai Bakong. Culling is based on the WLPO. The Swift Wildlife Action Team (or SWAT) undertakes to remove or cull crocodiles that attack humans but licences are issued for contract culling in selected rivers with quota and permits on hunting, killing and selling of crocodiles. With the down-listing in the Convention of International Trade in Endangered Species of Wild Fauna and Flora (CITES), there is a permitted quota of wild caught or harvested crocodile that may be traded internationally. CITES is an international agreement between governments with an aim to ensure that trade in specimens of wild animals and plants does not threaten their survival.